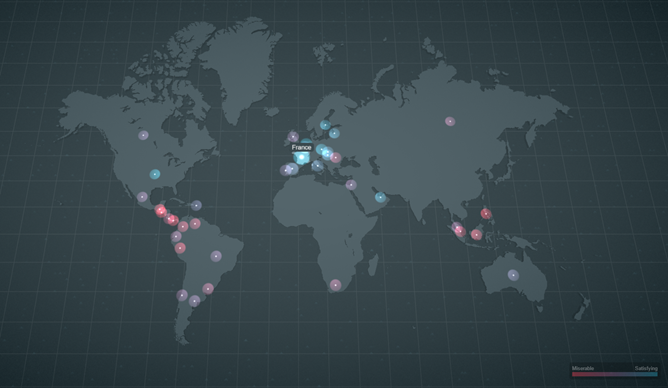 The web interface is accessible from the desktop, presented as a simple map of everywhere that Waze has reported on. (Trying it on mobile just downloads a PDF, but you can get there via Chrome for Android's desktop view.) Now, the data points that Waze collected can't actually determine the skill or aggressiveness of drivers, but factors like traffic density, road safety, commute times, number of accidents, and dozens of other inputs give a pretty good indication of where drivers are collectively miserable. The results aren't entirely surprising. The happiest drivers on earth in 2016 reside in the Netherlands, largely thanks to excellent and safe roads. France, the United States, the Czech Republic, and Sweden round out the top five of the 38 nations that Waze reported on (a total of 185 are actually in Waze's service area). The worst of the bunch was El Salvador, with huge traffic congestion, poor driver services, and poor access to cars and gas. The Philippines, Guatemala, Panama, and Indonesia weren't far behind. In the United States, the most miserable metro area to drive in is allegedly Honolulu, thanks to abysmal access to gas and parking. But even so, it's only at number 152 out of 186 cities worldwide. The happiest US drivers reside in Greensboro, North Carolina, thanks to very low traffic and safe roads. Every other city in the top ten was in France, with Valence taking home the title. Check out the website for a fun time - or not - or just hit the PDF report if you want the raw data.